These are great times. 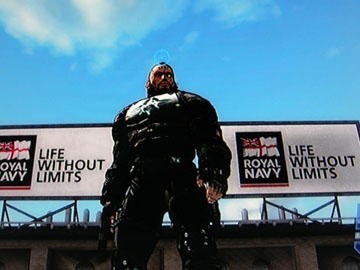 It is about time advertisers invaded our video games in the same way they do our driving (billboards), walking (fliyers, posters), and our private home (emails, bulk mail, text messages). 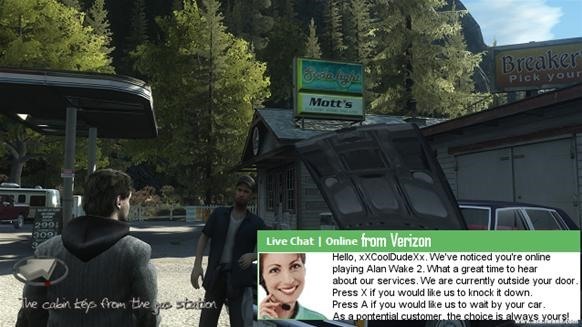 Now it's Alan Wake's turn to shine. 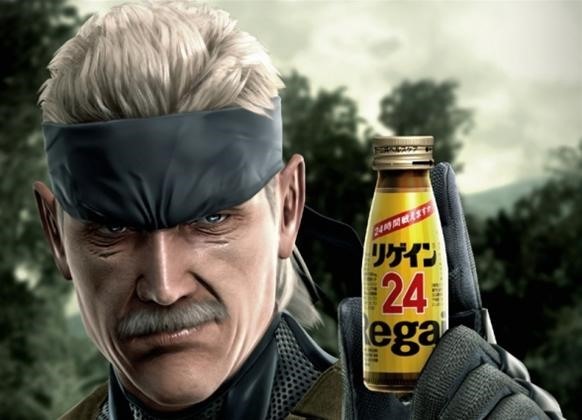 It's a great product placement. The player is too absorbed at this point with the great atmosphere and dangerous situation of the game. This Verizon commercial will give the player the strength and hope to carry on to survive this possessed lodge minutes before its full destruction. 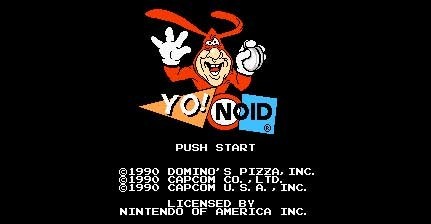 The best advertisers are always with you, not just in one instance like in the Verizon commercial. 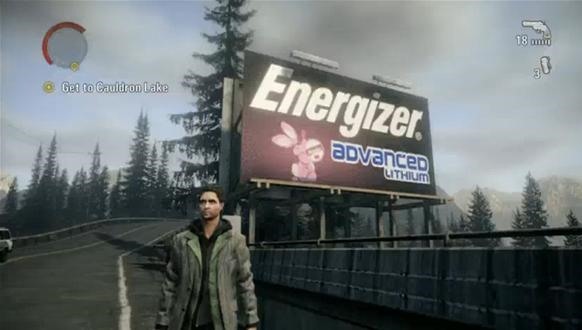 Throughout the game Alan Wake can collect batteries to power up his light, an essential weapon in the game. Energizer, recognizing this incredible responsibility, has stepped up to the plate and made the Energizer batteries the official batteries for end of the world situations. Lost your wife to the Darkness? Energizer is there for you. Because of the low resolution of the game, the Energizer batteries Alan picks up throughout the game can't really be recognized, but it's the thought that counts. Ahahaha! 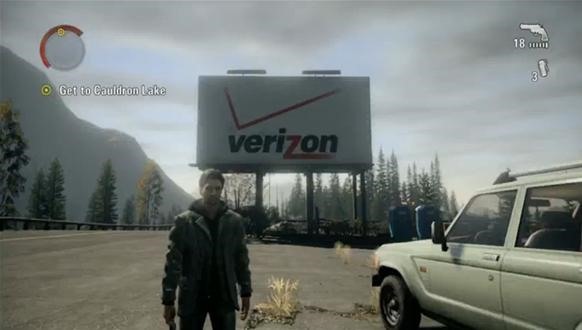 I thought the advertising in Alan Wake was suited given the present-day scenario, though it sort of shocked me when I saw the giant Verizon billboard. 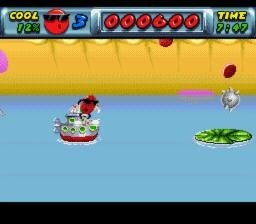 Also, that last image looks like a screenshot of Wake back in its early days. good eyes. It is a screen short from an early build from the game. The font and hub are different. Also, you don't go through that area or talk to that person in the game. I can't put a link in the comment, but there is a cnbc article that talks about in game advertising and how MS bought a company just for that for $400 million. It talks about Alan Wake too. Another article talks about Ford advertisements but that might just be the cars you can drive in the game. Since I know nothing about cars, I can't tell if some of them were Ford or not.